The Roe 8 road project will be cancelled if the Labor Party wins the upcoming state election, opposition leader Mark McGowan said today, even though the government has already signed a contract for construction, with $236 million of funding to be re-allocated to three alternative roads. Labor proposal to cancel Rowe Hwy extension. I have no doubt the contractors will be organising a significant claim against the state if McGowan's populist position gets up. He should be the leader of the Greens. Have a look at the cost the taxpayer's had to foot in Victoria over the cancellation of the East West link under Premier Andrews. Like South Australia, Victoria's renewable policies will hike power costs through the roof. Let's hope McGowan does not adopt that Green policy in WA. *Privatisation* will "hike electricity prices through the roof" far more than embracing renewable technology, mate. Your concern is misdirected. 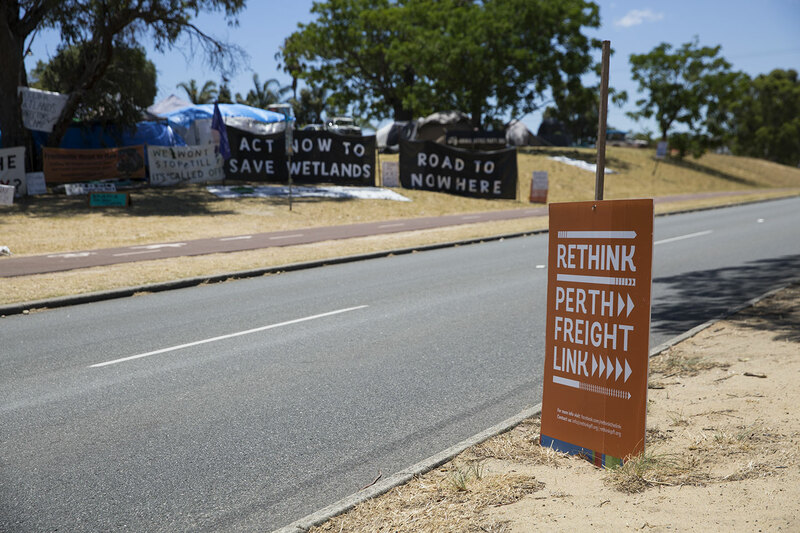 The Roe 8 or Perth Freight Link project never had a business case prepared. It was not on the books anywhere as a project prior to the election of the Abbott government. It was another Abbott brain spasm. It has never been justified and WA has many more important and useful infrastructure projects that need to be built. The project will destroy some of the last remnants of native vegetation in Perth and do irretrievable damage to the Beelier wetlands. The planning of a new port, the Outer Harbour, is/was well underway and should be built. As noted - the PFL is a road to nowhere as it doesn't even get to the port. A terrible waste of money and with terrible damage to local communities. The politics of Barnett and his cronies are quickly coming back to bite them. Rod, Clearly you are a transport planner. I assume your input is valued in your job at Main Roads or as one of their consultants. Abbott is an either amazing man to have a handle on State infrastructure priorities, or perhaps the recommendation for Roe 8 came from outside the office of the PM. The road corridor has been part of the Metro Region Scheme for how long? What a vote grabbing tool...seriously the guy is a whiner always complains and incapable of an original thought. So what is his alternative. This is so well thought through . The so called populist view is the typical nymby reaction to most things in WA . If people took the time out to understand what this means to WA and how it is actually improving the local environment and the lack of impact maybe McGowan would be a cynical with his opportunist voote seeking proclamation. .
lets maybe take a look at the Barnett Governments push to see this project full-filled. Questionable motivation on a project with massive community back lash and no finishing point. The port harbour remains a stunning draw card to the overall Perth environment. To see it corralled in short sited politics and pushed to deliver a service that is clearly better facilitated in other locations is appalling. Do we want to grow this great state of ours or continue to flog obsolete infrastructure. If we want to focus on wasted tax payer dollars then perhaps we need to address this question to the incumbents and ask where have our resource profits gone. As far as vote grabbing goes...crikey we are rapidly facing no alternatives. Waste of money to begin with!! Great! I will definately vote for Labour this election as I think this project is really badly thought through. Freo port is at capacity. Let's wait until there is an alternative site to build a freight link to. Widening of Mitchell Freeway would be my preference. Would any business start a $2b project without a business case? Which business would run a $2 billion dollar project without a business case, transparency or an end game? The reason mayors, the general public, infrastructure planners AND environmental groups are so urgently trying to stop WA's first toll road is to save WA several billion dollars, retain an internationally recognised and federally protected environmental biodiversity hotspot and redirect funds to the outer harbour and rail projects which will help a diversifying WA industry in the long term. This will reduce congestion across Perth, save billions of dollars (and then re invest with proper planning and supporting transparent business cases into road projects backed by infrastructure planners). To do any further work on this project now would be a complete waste of police resources, especially as the project thankfully will not be going ahead as planned anymore! https://www.youtube.com/watch?v=ykWZMpAm-gI Worth watching if you haven't already. Just for an alternative option. The Fremantle Port will not be able to deal with the container traffic and other shipping requirements in the near future so building a road to a soon to be redundant port seems like a waste of money. Instead develop the Outer Harbour in Kwinana, and sell off/develop the Port land in Fremantle for Residential/Commercial use and make Fremantle a city people want to actually visit and live in, make it a port purely for cruise liners to get a good first impression of city and increase tourism from cruise line traffic. With the Kwinana Outer Harbour move all other shipping, (live stock, containers, cars) to this location. Unfortunately this will require a freight link to the major distribution areas near the airport. To reduce double handling and to minimize the cost of freight they will require a road freight link from Kwinana to the distribution centers. For this Freight Link I would recommend turning Stock Road into a freeway that links up with the Roe Highway, taking the heavy haulage strain off the freeway and charging a toll to freight companies to use which they will be happy to pay because the cost reduction in time/money will far out weigh the toll cost to use the road. The plan outlined above would reduce congestion on the Freeway, reduce heavy freight on South Street and Leach Highway and Canning Highway. Unfortunately you still need to link the Roe Highway to Stock Road, so Roe 8 is a requirement for the future of a usable Road system to reduce congestion and make our roads safer and more reliable. Its unfortunate McGowan has become a puppet of the Greens to secure the Fremantle vote. Hats off to Barnett for pushing on with a project that isn't popular. It would be easy in a tight election to do nothing and once again in WA, nothing gets done. Understand that the state of WA is broke ! To fix that the government will and needs to sell Fremantle Port, aiming for $2 Billion. No business consortium, International or local, would pay that $$ without the infrastructure in place (Melbourne port achieved $10 Billion recently). The WA government uses State and Federal $$ to build the Roe, which will go all the way into Fremantle(not a road to nowhere), infrastructure complete, sale goes ahead, state reduces debt. The state government then has the future funds and ability to build an Outer Harbour in Cockburn Sound which it again owns. WA will have and needs the capacity of 2 Ports. On the point of the Roe Hwy, the only reason the land is still actually natural bush and not full of housing estates is because it has been planned and left as a road reserve for the last 40 years. Only the road alignment is being cleared and a fair proportion is being left around the road reserve as a buffer between the road and housing estates. Also the Roe 8 project has a commitment for around 400 hectares of Bush Forever in other designated areas that offsets the nature bush that is being removed. A pragmatic, rational and informed person should be able to understand that the Roe 8 and 9 is an essential piece of infrastructure for WA. It will aid in the reduction of state debt, assist in the building of the future Outer Harbour and if the greenies had any clue they would be fighting for a bigger offset in future areas to be preserved as Bush Forever. The Roe Freeway extensions will be built eventually. If Labor get in the construction will be paused until the Libs get back in.I am a traditional Labor voter but I think Roe is required for future traffic flow.